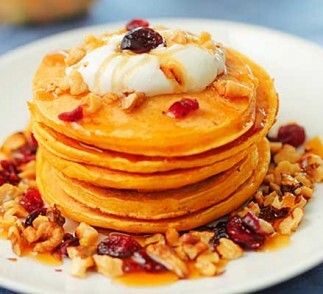 Big, fluffy pumpkin pancakes, made extra rich with VOSKOS® Greek Yogurt. The slightly tart flavor of VOSKOS® brings out the sweetness of the pumpkin and makes these fall-flavored pancakes a breakfast treat you’ll make all year round. In a large bowl, whisk together eggs, oil, sugar, milk, VOSKOS® Greek Yogurt and pumpkin puree. Transfer liquid mixture to dry mixture. Mix with a spatula until combined. Heat a griddle over medium heat. Pour pancakes, ¼ measuring cup per pancake, into hot griddle. Cook 2-3 minutes on each side, until puffy and set.